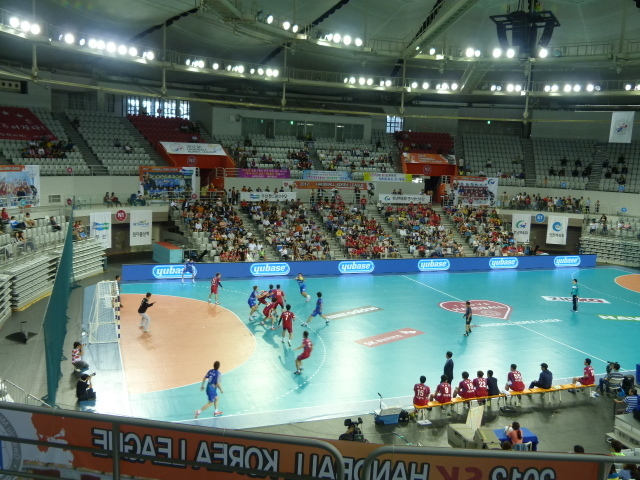 I’d just finished watching a men’s handball match at the Fencing Gymnasium in Seoul’s Olympic Park and as the air-conditioning was making it a pleasurable place to be, I didn’t hurry out afterwards. Strangely enough, neither did anyone else. After a few minutes I concluded that the game we had just watched wasn’t the full extent of the afternoon’s entertainment and so I stuck around to see what would happen next. What we got was a women’s handball game and just like the men’s match it was the second leg of the Championship play-off and the culmination of a season that had started back in February. As with the men’s game, I had no idea of the score from the first leg and so not only was I watching a game where I didn’t have any real knowledge of the rules, I was completely ignorant as to which team were winning. 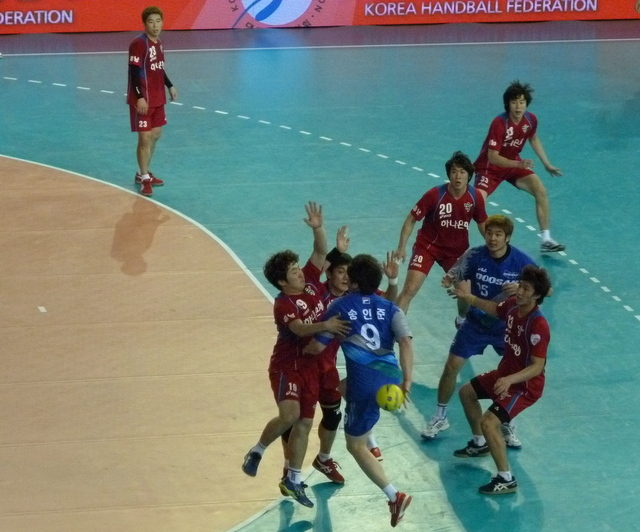 What I did know was that the team playing in red were Samcheok as they had their team name on their shirts. Not just Samcheok though, but Wonderful Samcheok. Hmm. I’ve been to Samcheok a couple of times and whilst it’s a decent enough place I’d say Wonderful is pushing it a bit. The team in blue were Incheon, just Incheon I think, rather than bigging themselves with a name like, say, Quite Close to Seoul Incheon. Wonderful Samcheok lead for most of the game, although as I said, I’d no idea which team was ahead on aggregate. The play was just as aggressive as that of the men’s game that I’d just watched and both teams were well supported. 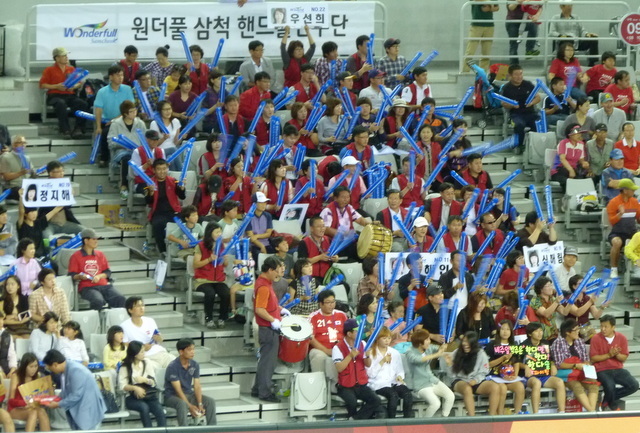 It was a similar atmosphere to the basketball games. 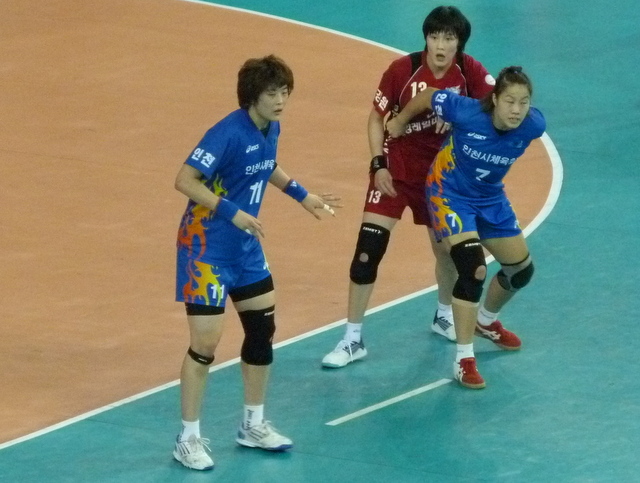 As the game drew to a close Incheon narrowed the gap and with a big contribution from the best player on the court, eleven goal striker Ryu Eun Hui, they forced a draw. I can’t remember now but I think it was twenty something all. Ryu Eun Hui – Star of the show. The main interest for me at this point was seeing which team had actually won. You’d think that it would have been evident from the play with perhaps one team chasing the game and the other time-wasting. It wasn’t though and I had to wait for the celebrations at the final whistle to discover that Incheon were the champions. 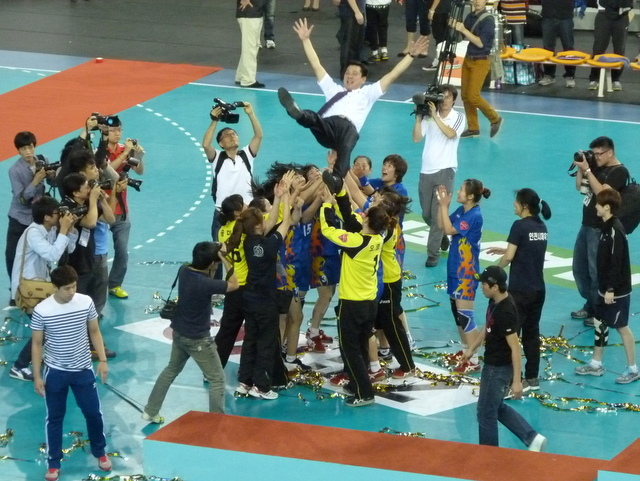 They tossed their coach in the air, as seems compulsory at sporting events over here, and collected the trophy. As traditional as playing ‘We Are The Champions’. So, after forty-seven years without seeing a single handball game I’d now seen two in an afternoon. It’s not something that I’d probably hurry back to, although with the new season not starting until February it’s something I don’t have to give any thought to for a while yet. I’d been to watch the tennis at the Olympic Park and as I was heading back to the subway station afterwards I noticed a few television trucks outside of the Fencing Gymnasium. There was a sign outside mentioning handball and as one of the doors to the venue was open I went inside to see if there was anything going on. I could hear noises from behind a curtain and a closer look revealed that there was indeed a handball game taking place. To be truthful handball isn’t a game that I’ve ever given very much thought to. I occasionally stumble across a match as I’m flicking through the tv channels, but I rarely watch for longer than the time necessary to establish that it’s, well, handball. I’m usually quite happy to watch most sport, but handball just seems like an unnecessary version of football, albeit not so good. Sports like rugby or basketball are different enough from football to make them interesting, handball though is really just a rip-off of a game of five-a-side with your mates. The only difference seems to be that you use your hands rather than your feet. I’ve read that it’s popular in Scandinavia, but then again, so are fermented shark burgers. It still doesn’t make it right. Curiosity trumped reticence though and I joined around five hundred other spectators. A team in red that I later discovered to be Choongnam were playing a team in blue that turned out to be a side owned by Doosan. 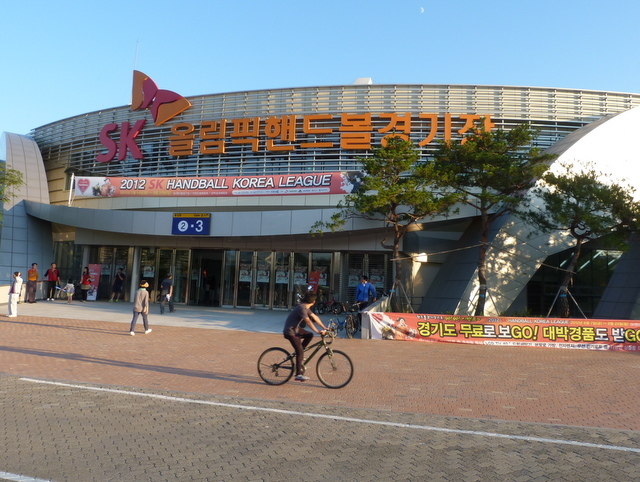 The game was ten minutes into the second half and Choongnam were ahead by a few. For those of you who aren’t familiar with any of the rules other than you aren’t allowed to kick the ball, I’ll pass on what I spotted. If you imagine five-a-side football, but with seven players on each team that’s it. So, seven-a-side football. I couldn’t work out whether outfield players were allowed in the box or not and I’m not sure the ref knew either. Maybe the players just decide between themselves before the start, but don’t really pay much attention to it. Whatever. They’ve borrowed two minutes suspensions from ice-hockey but that’s about the only difference that I noticed. It’s quite an aggressive game, or at least this one was, with players regularly getting clattered. I kept an eye on the keepers as apparently it was during Peter Schmeichel’s time as a handball goalie that he developed his famous ‘star-jump’ shot stopping technique. Both keepers spread themselves in a similar way whenever the ball was hurled towards goal but, unlike Schmeichel, rarely seemed to know where the ball was going until it either hit the back of the net or smacked them in the chops. Interestingly, Schmeichel’s other trademark activity of bollocking the defence whenever he made a mistake didn’t seem to be something that he’d picked up from his handball days. A Doosan player tries the ball concealment tactic known as ‘Drug-smuggling’. 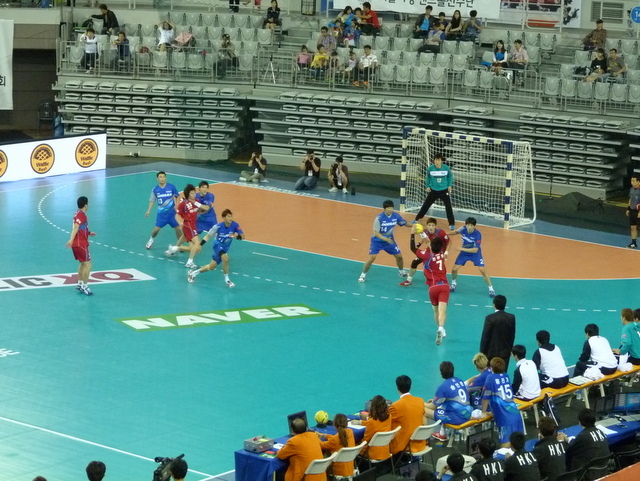 Choongnam kept their lead until the end, running out 28-22 victors. Oddly though it was Doosan who celebrated, receiving a trophy, throwing their coach in the air and lining up behind a banner where one fella mixed up his V for Victory gesture with something else altogether. Harvey Smith celebrates another win. The mystery was solved when I discovered that this match was the second leg of the Championship play-off and so I assume that Doosan must have gone into the game with at least a seven goal advantage from the previous encounter. I’ve no idea whether it was close or not. Doosan could have just nicked a thrilling aggregate victory or they could have strolled through a match made meaningless by the first leg. The air-conditioning was good though and that’s what mattered most.